Gloria A. Jones, 86, of Dover passed away early Sunday, August 19, 2018 at Hennis Care Center in Dover following an extended illness. Born on July 1, 1932 in Dover, she was the daughter of the late Ralph and Caroline (Gopp) Lewis. She graduated from Dover High School. On June 1, 1952, she married the love of her life, William “Bill” Jones, who survives. Gloria was a member of St. John’s United Church of Christ in Dover, where was formerly involved with the Rebecca’s Circle. She was also a member o the Tuscarawas County Homemakers and the Winfield Homemakers. 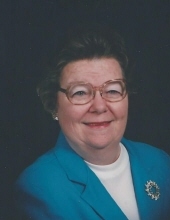 In addition to her husband, Bill, she leaves behind her granddaughters; Jackie (Dale) Kandel of Dover, Christina “Tina” (Ben) Armstrong of Rush Township; great-grandchildren, Kaylee and Mackenzie Kandel of Dover, and Mason and Max Armstrong of Rush Township; her daughter in-law, Annette Jones of Dover; sister in-law, Gloria Lewis of New Philadelphia; along with several nieces and nephews. Gloria was preceded in death by her parents; her two sons, Rick and Thomas Jones; along with her brother, James Lewis. In honoring Gloria’s wishes, a private family graveside service will take place at Bunker Hill Cemetery in Winfield. To sign an online guestbook, visit the obituary link on the funeral home’s website. Memorial contributions can be made to St. John’s United Church of Christ, 409 N. Wooster Ave, Dover, Ohio 44622.